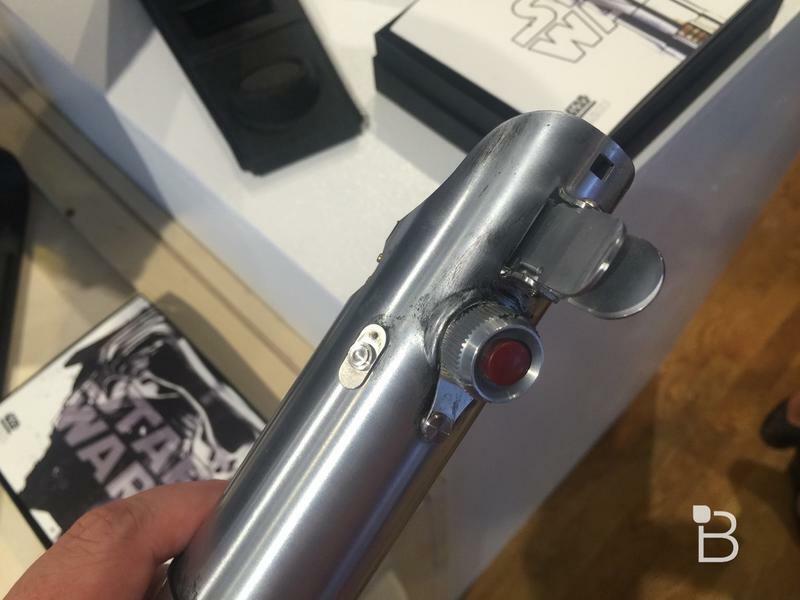 Star Wars Collectibles Ultimate Studio Edition hands-on: Insanely awesome! 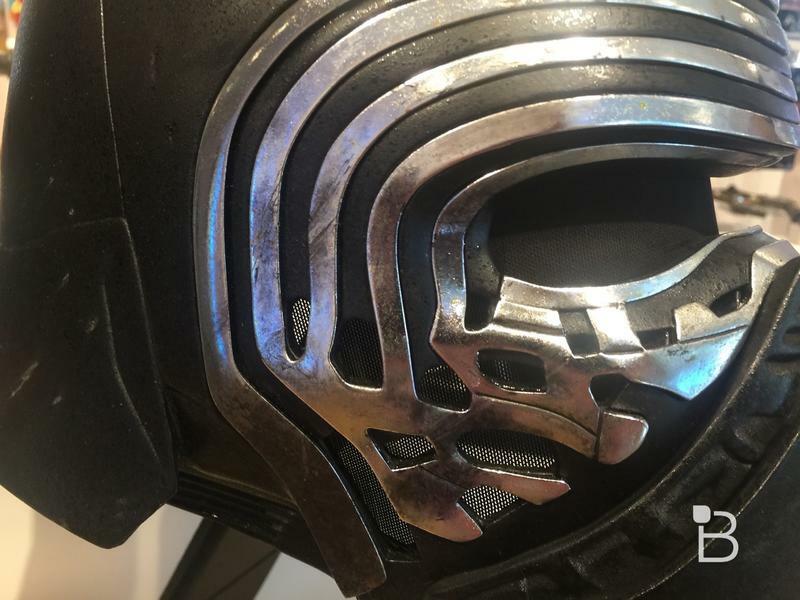 When Disney announced plans to sell super realistic 3D-printed replicas of some of the most iconic props from Star Wars: The Force Awakens we could barely contain our excitement. 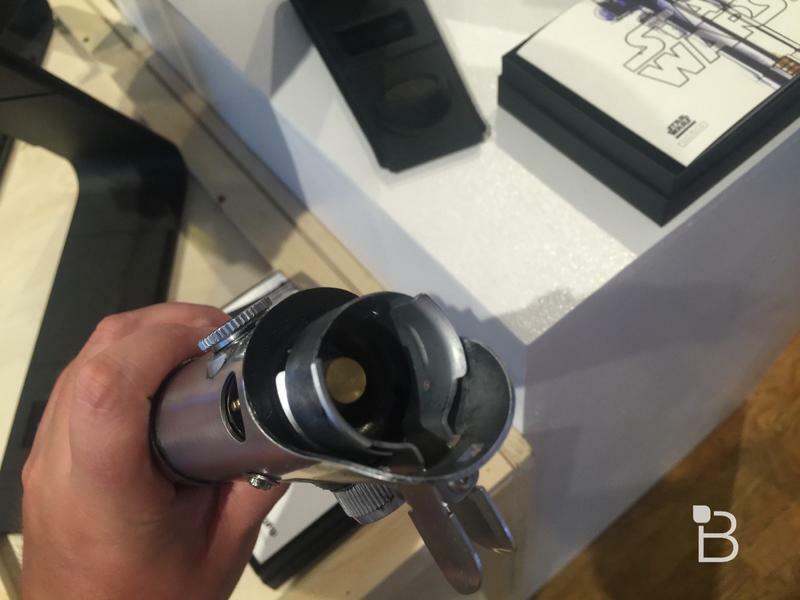 Then we had a chance to check out a few of these collectibles in person and they definitely live up to the hype. 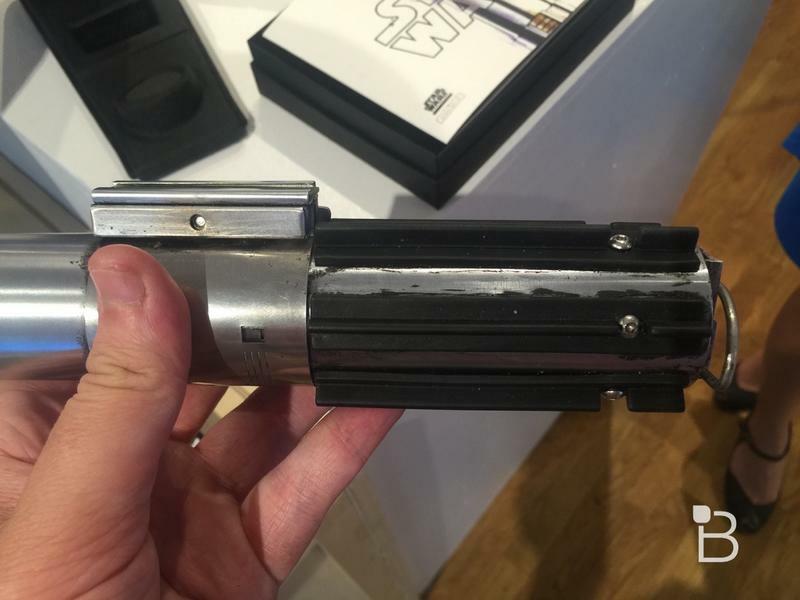 We seriously can’t overstate how awesome these replicas turned out. 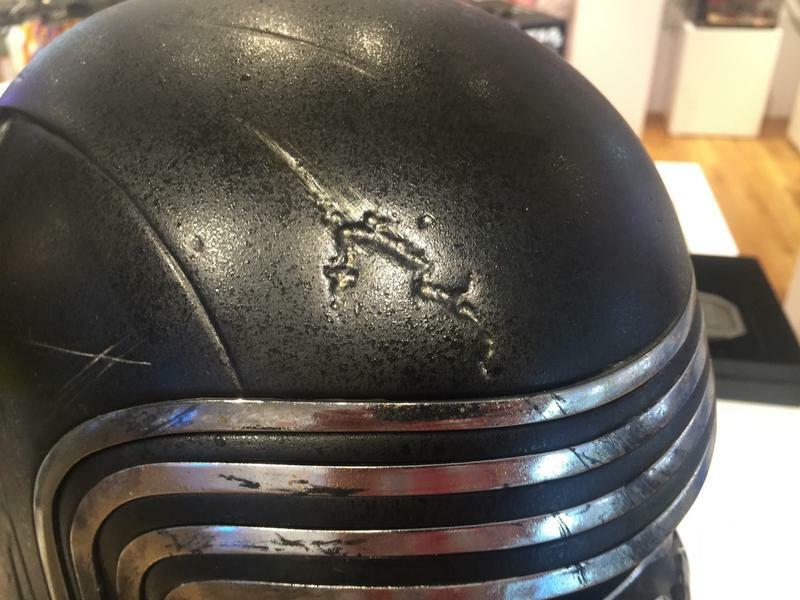 They’re certainly not cheap, ranging from $1,250 for a lightsaber hilt or Rey’s staff to a whopping $3,500 for a limited edition copy of Darth Vader’s melted helmet. 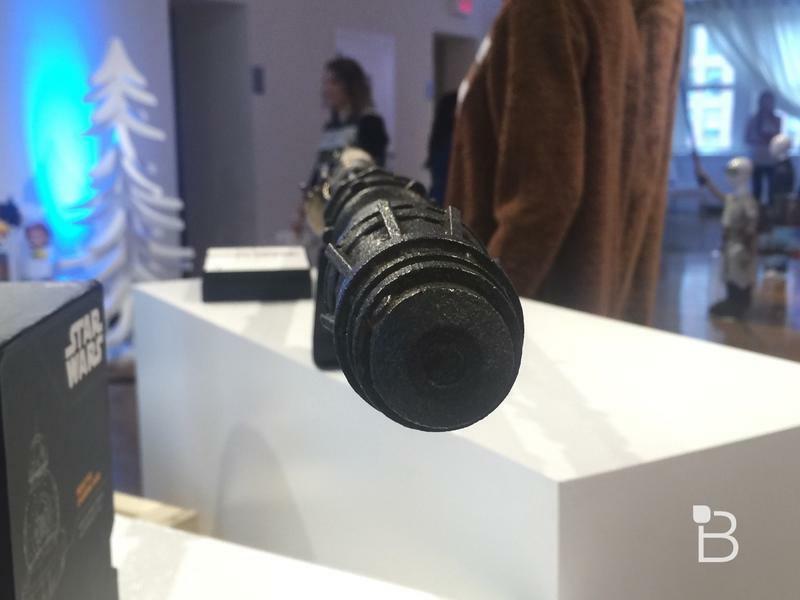 But if you’re totally obsessed with Star Wars or need a great gift for that special Force Awakens fanatic in your life this is a pretty great way to go all out. 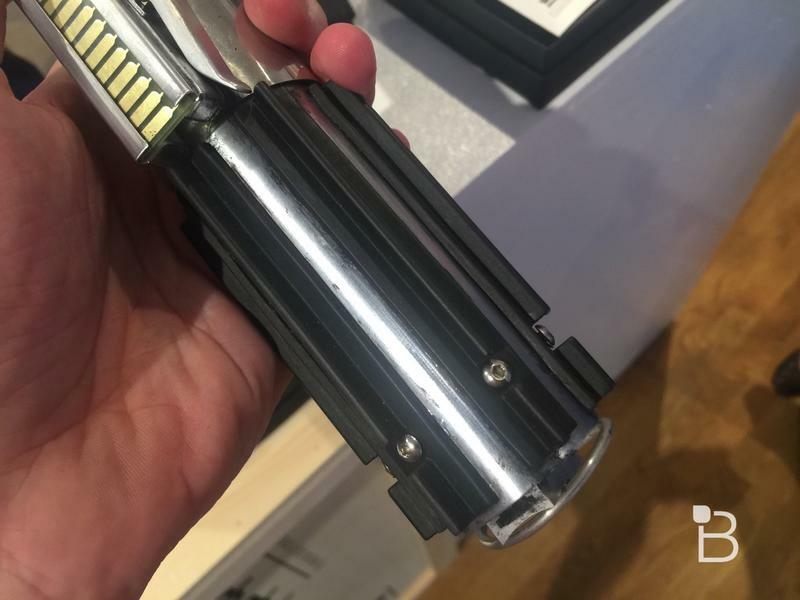 Holding a perfect replica of the Skywalker lightsaber (most recently seen in Rey’s possession) is probably the closest I’ll ever get to an actual Jedi battle. It’s weighted perfectly to feel substantial without being too heavy, and the metal is sleek and polished with just the right amount of wear and tear. I really like the grips around the handle, which make it easy to hold and give the entire design a unique look. It’s that kind of subtle attention to detail that you might not notice on the big screen, or even after repeated viewings at home. 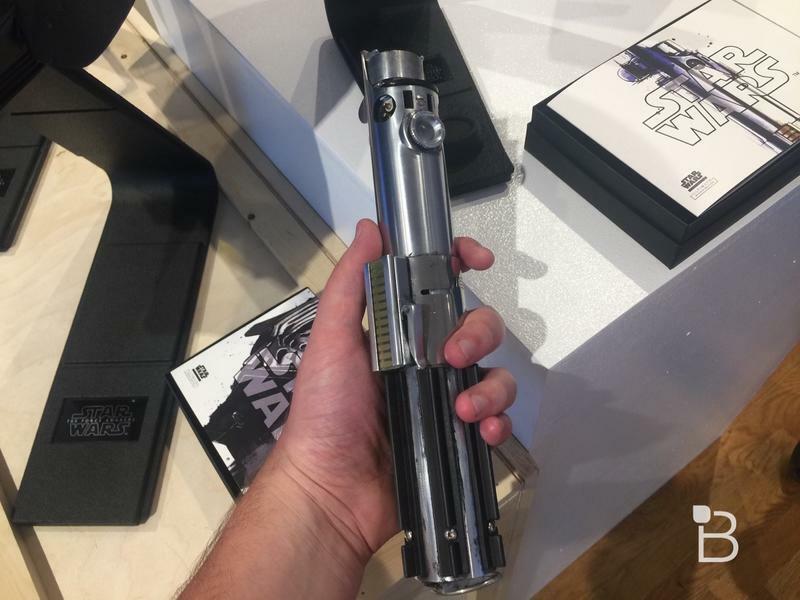 But once you’re actually holding the prop (well, a perfect replica, but come one) you quickly notice those tiny features that makes the Star Wars universe so rich and engaging. 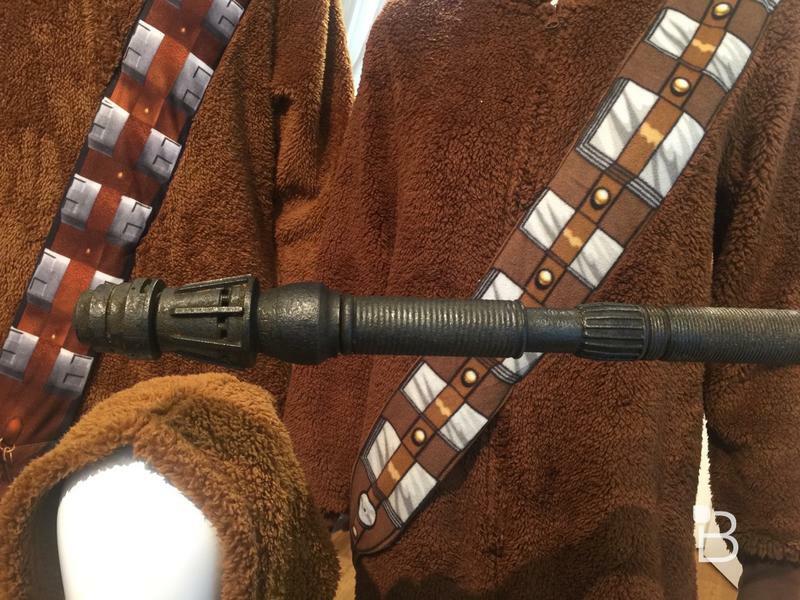 Also on display was Rey’s staff, which looks just as awesome as the lightsaber even if it’s not as significant to the plot. First off, this thing is huge. 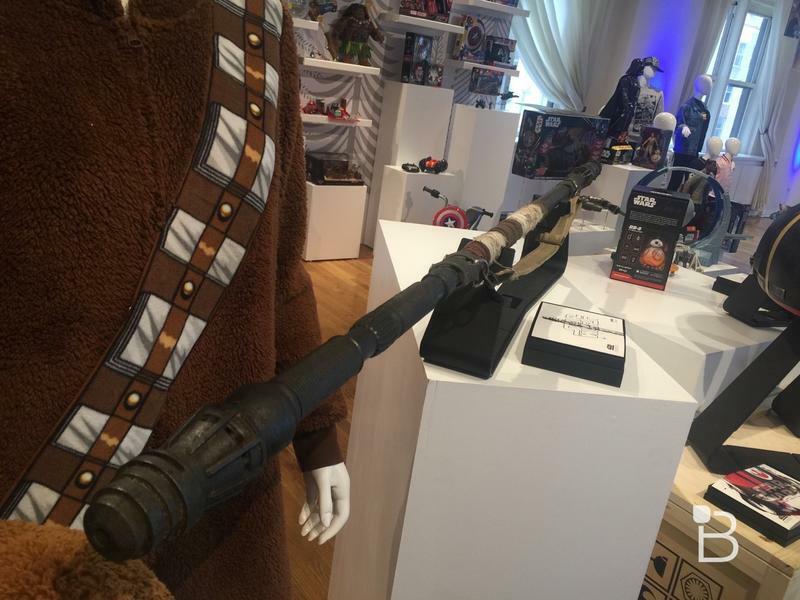 I had forgotten how large the weapon looked onscreen, and in person it seemed even bigger. 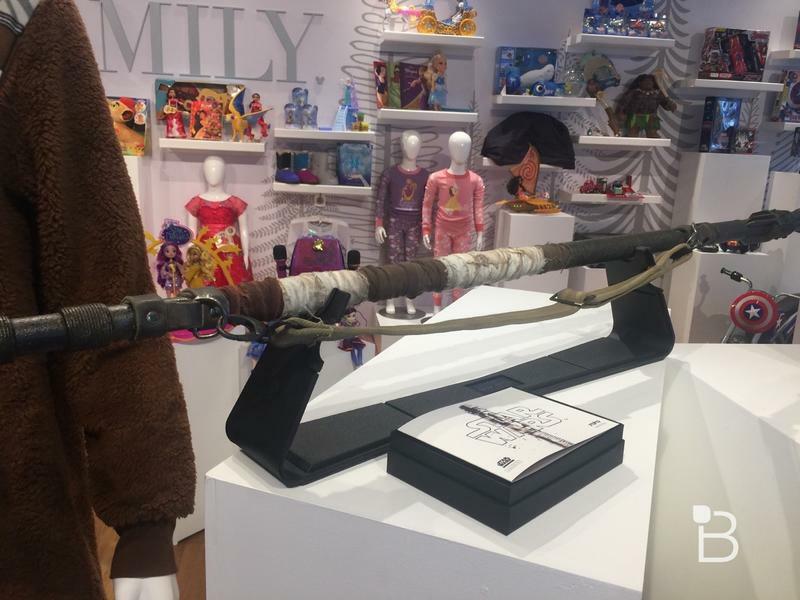 It’s also pretty heavy, which makes sense since it’s basically just a long metal rod with some cloth wrapped around it. 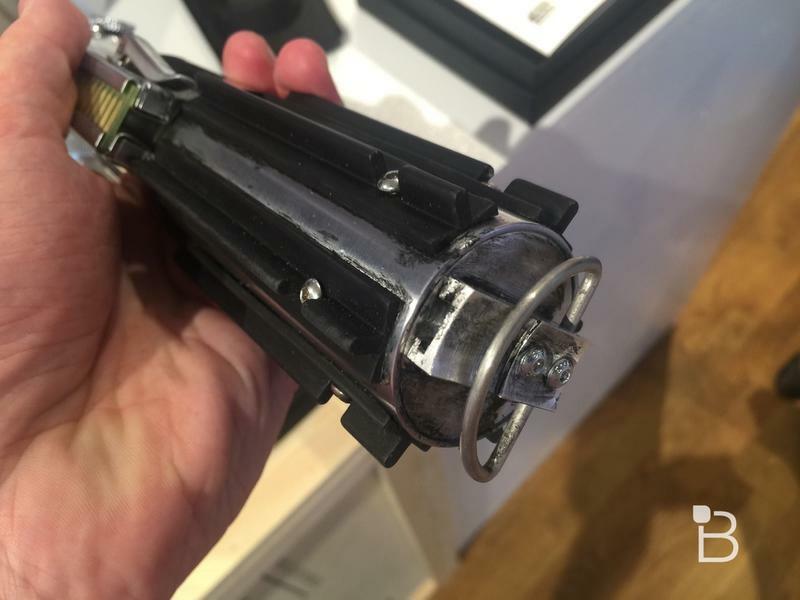 After holding the staff for a brief moment I’m pretty impressed that Daisy Ridley was able to carry it around on set and make it look so easy. 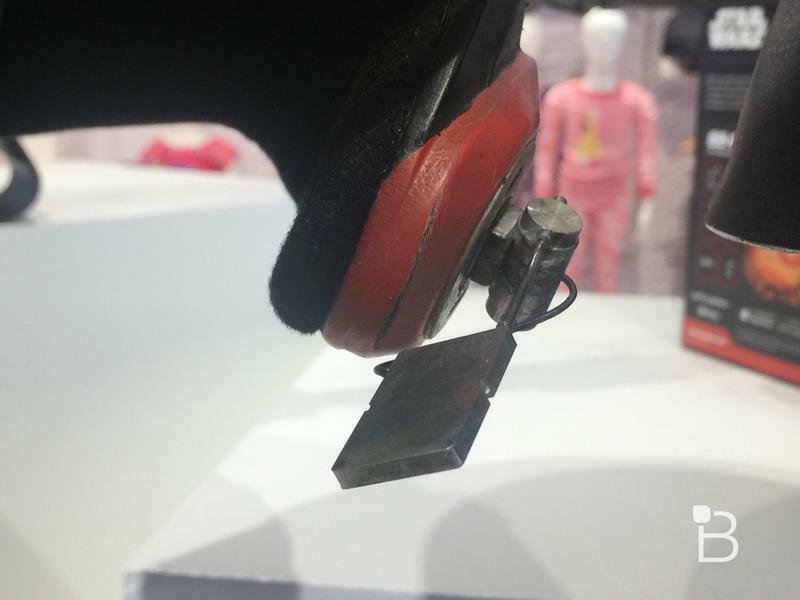 A little online research reveals that the original model was actually even larger, but they scaled it down slightly to make the film. There’s plenty of tiny details to see here as well, like the small etchings along the staff and concentric circles on either end. 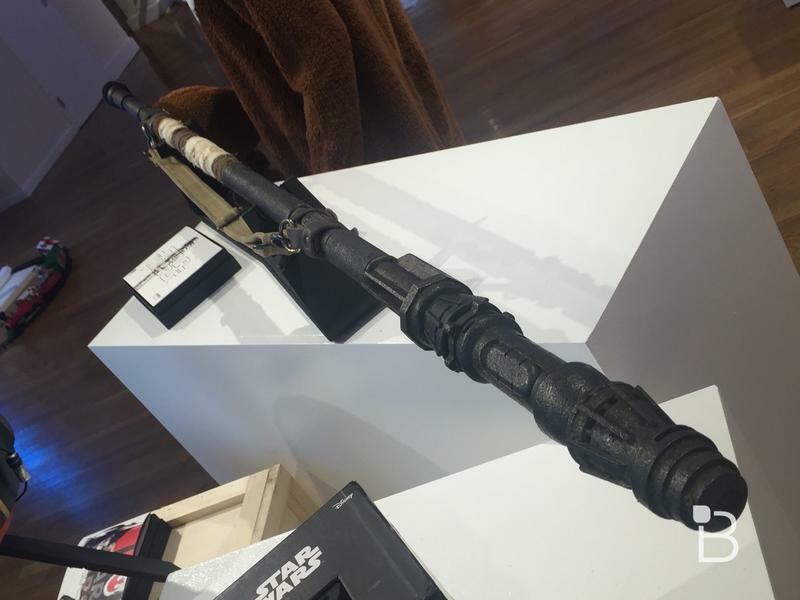 Rey salvaged the staff from the wreckage left behind by the Battle of Jakku and it almost likes like a piece of some larger vehicle re-purposed for her life on the desert planet. I couldn’t actually put the helmet on but it might still be my favorite of the bunch. 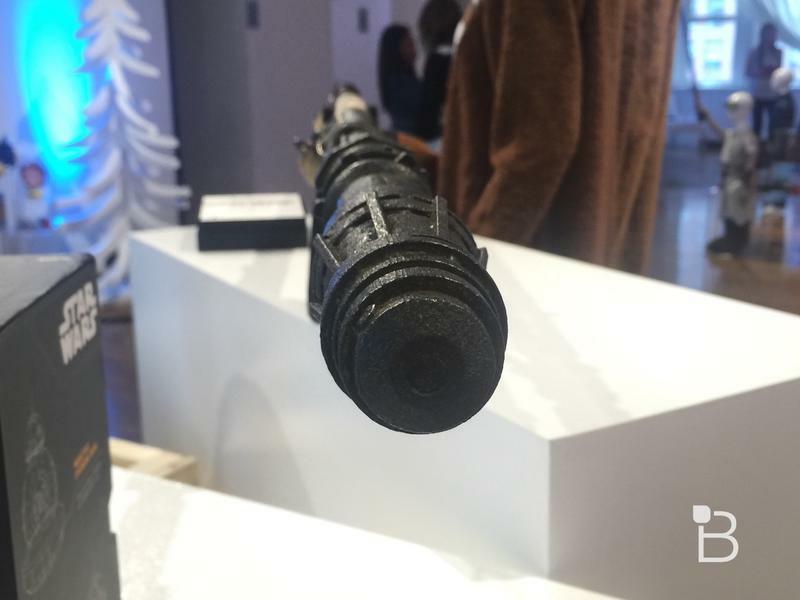 The detail is truly amazing, giving the prop a real battle-worn look. 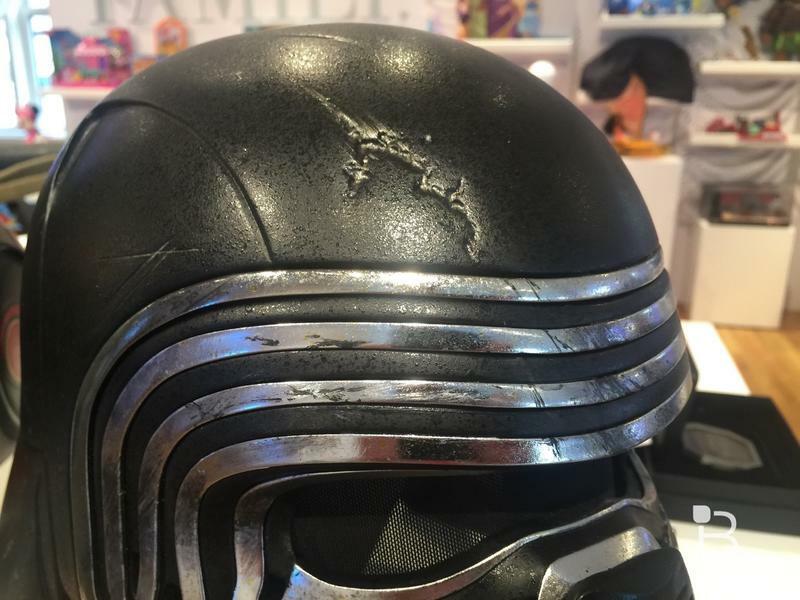 That gash near the top of the helmet is so realistic and the smaller scratches in the metal work are great too. 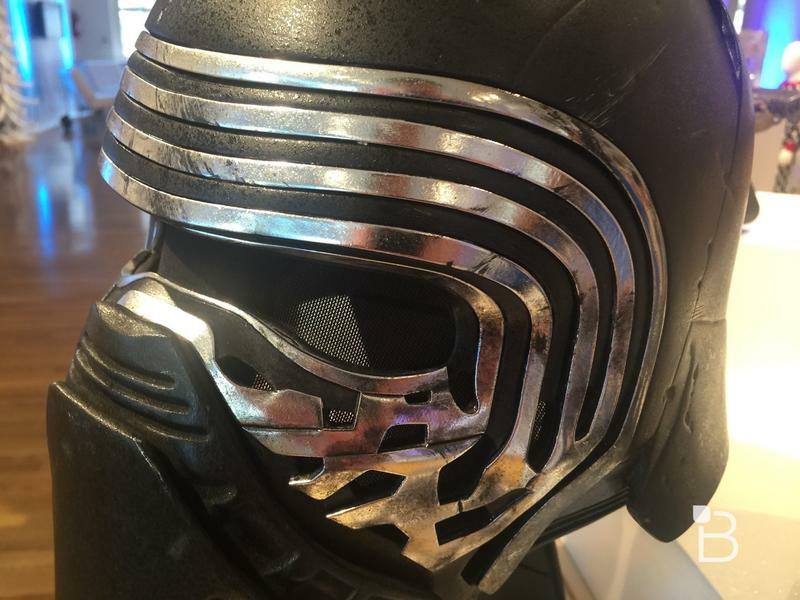 The thin mesh material used to cover his eyes and hide Kylo Ren’s identity is a nice touch as well. 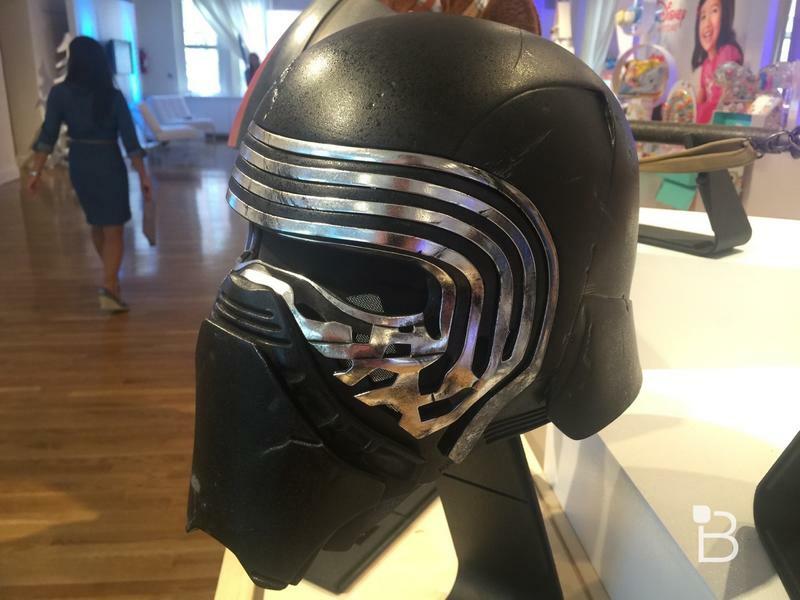 Standing face to face with the the helmet almost felt as intimidating as facing off with an actual Sith Lord. 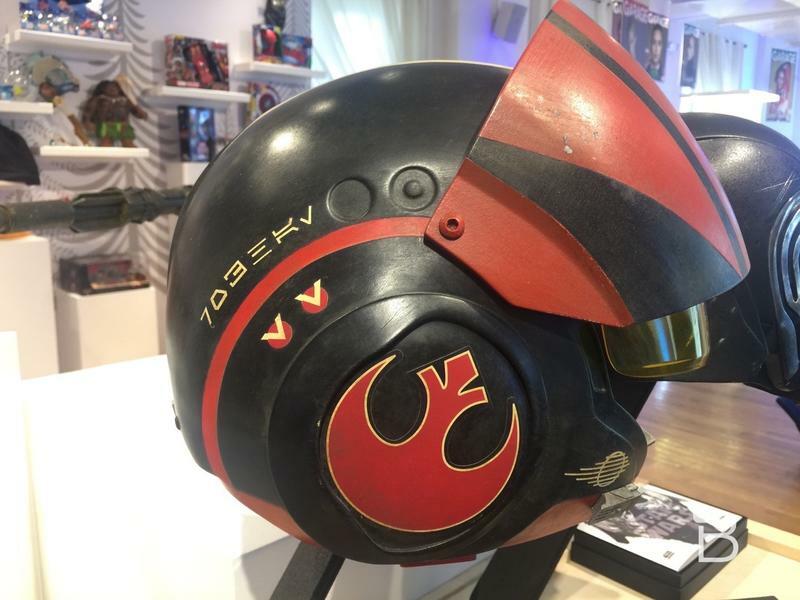 Finally there’s Poe Dameron’s helmet. It’s a perfect reflection of the character with a colorful design that’s both carelessly cool and rugged all at once. 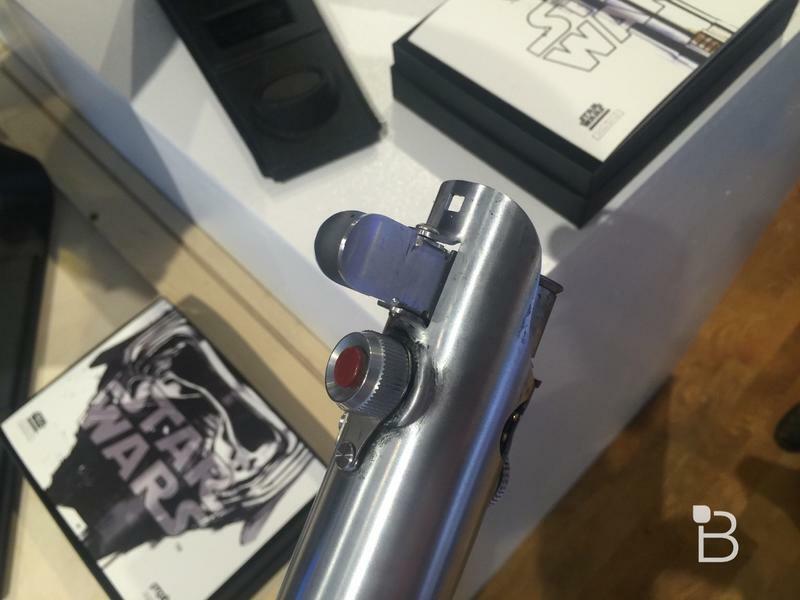 The Resistance logo looks great and the small attached microphone is a nice touch too. 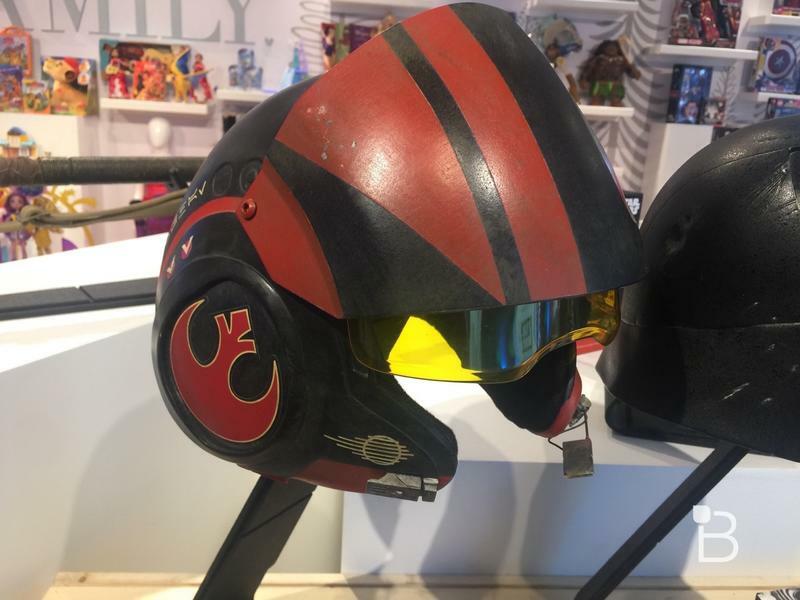 The helmet may actually be the least damaged prop of the bunch, which probably says something about Dameron’s impressive skills as a fighter pilot. 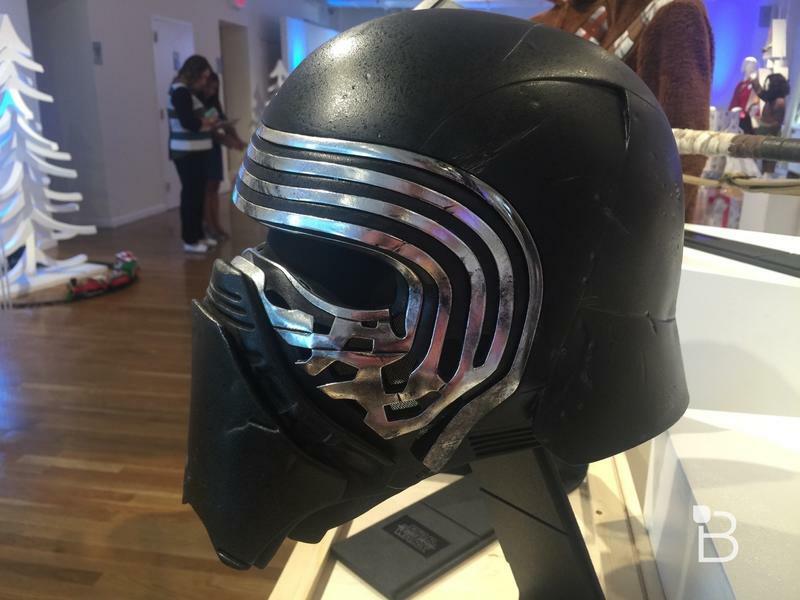 The rest of the collectibles, which includes Kylo Ren’s lightsaber hilt, Chewbacca’s bowcaster and Finn’s bloodied Stormtrooper helmet weren’t on display. But based on what I did so I’m pretty confident that the entire lineup is probably just as awesome. 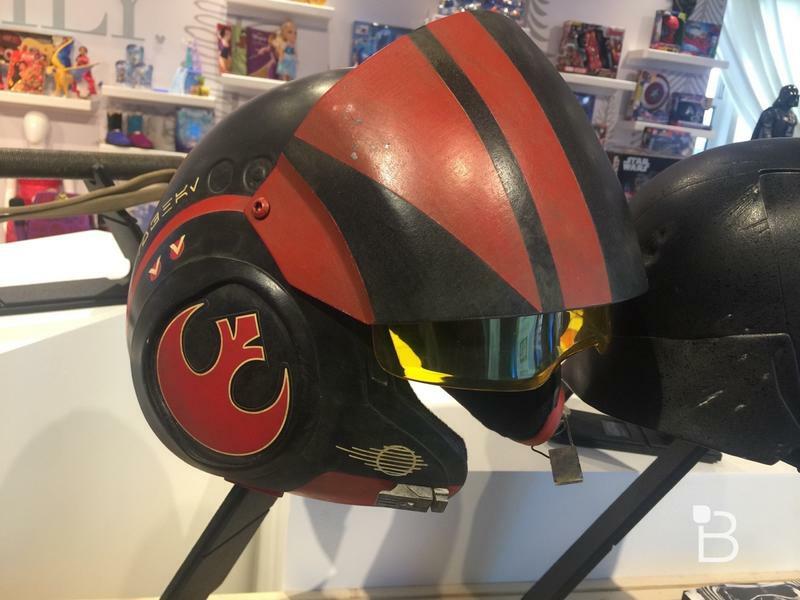 Check out the video below for a behind the scenes look at how Disney makes these amazing Star Wars props or hit the source link to order one for yourself.